With so many "do it yourselfers" finding out how great RAPTOR® Liner is, we would love to see what you have been up to. Email us some before and after shots with a little explanation of what your plan was and how it turned out. We know that Raptor Liner was intended for pick up truck beds but somehow it has found itself sleeping around. Raptor is now being used for more things outside the box than inside. We would love to share your experience with our great product. The SHERP is by far one of the world's best amphibious vehicles. It can go virtually anywhere in comfort. With that ability comes the wear and tear of the different environments it goes into whether plus 40 or minus 40. SHERP uses RAPTOR to coat and cover its exterior and interior knowing it will be in places that will push our coating to it's limits and even beyond. this 2019 Jeep JLU is gorgeous. 2 tone RAPTOR with a subtle but classy red stripe to set the black and gun metal gray off! Wow... has to be one of our top 10 customer creations!!! What can you RAPTOR??? I did the exterior of the tub, doors, hood and windshield and the after market corner guards with the green. I did the rear corners green and then put the metal cloak corner guards over the sprayed tub, so kind of over killed the application of the Raptor Liner under the corner guards. I used 2 of the 4 L kits to do all that. I have one more 4L kit to do the additional coats on the body/doors and hood. P.S. Ignore the broken windshield. LOL. She tipped forward on me while I was spraying between the tub and the window frame. I finished my GEO Tracker finally. Got to say I’m really impressed with the results using U-pol Raptor. Here’s some before and after pictures. thanks for all your info prior to my project!!! HVLP @ 30psi, nozzle 1.8mm for 2 first coats (this gave a descent penetration of the liner into the wood as the material was atomized in fine particles). The end result is a fairly uniform and will offer a safe anti slip floor. Dead on with what I was looking for. Craig had a customer bring him this Boler trailer that was tired in disarray. It's appearance needed a new look and after using RAPTOR on some other small projects the decision was to make this little gem into a two tone beauty. Light beige up top with black down below and voila... a nice looking tow!!! Yourger took his tired Toyota 4 Runner that was still running like a top, and Raptorized it. Some punky rust holes were patched up. and using the textured RAPTOR Liner finish, he was able to rejuvinate his ride and feel good about the outcome. For the price of a couple Raptor kits and some TLC... he now is driving around in style! Fernando asked how he could transform his GMC Envoy into a cool looking SUV that would grab attention even though it's not the newest and most expensive SUV on the block any more. Well, attention to detail with his preparation and excellent application of our reliable Black Raptor liner, has renewed his ride and made it one of the best tranformations we have seen. Fernando loved the product and it's easy application. He was extra careful to prep the project to the best of his abilities as a "do it yourselfer" but looking at his photos, he gets an A plus for effort!!! Chris in BC has taken his trawler and totally covered it from the waterline up. He used Reflex Blue tint for the hull and a light grey tint for the rest. He loves the way it looks and how durable it is for his day to day use. Well done Chris!!! So, I was told that in California, taxi and police cars were covering their rear vinyl seats with RAPTOR Liner to make them easy to clean off and really durable. I finally got around to trying it but I can't give any long term feedback yet as to how it holds up outside in the elements all summer long. Here are some pics of my 2003 Seadoo LRV 4 SEATER with built in sun deck at the back. The rear seat is original and so is all the vinyl on the sun deck. We used U-pol Tiger Seal to fill up the 2 big holes at the back of the passenger seat. Shaped it, let it dry and took all 3 seats off the watercraft. A quick taping off of the white fiberglass and a wipe down of the old vinyl that was ready to disintegrate any month now and we were ready to RAPTOR. Nothing to loose really as new vinyl covers would cost around 1000 Canadian and I'd still have to hire someone to install with proper tools and stainless staples. Not something I wanted to try myself. RAPTOR has so many uses. We sell so much across Canada for just automotive but we are getting customers telling us about other ways the used it and how great it is. Will be posting on the website as they share with us. All I can tell you is if RAPTOR holds up as well as it turned out, I'm ecstatic!!! Next project is some unfinished unassembled Muskoka chairs we picked up at Costco for $49 each. Wife wants a particular colour but that's another story. I'm very pleased with the final result. I did learn a few things that I thought I would share - I assumed it would be thick and fill in nail, staple or knot holes...not true. I actually used the paint as filler between the first & second coat. The floor needs to be perfectly flat/smooth. I would likely try rolling my next project as the second coat was difficult to spray. The nozzle kept plugging. All things I learned along the way. Still don't understand why they put carpet in boats so am very happy with the way this turned out. Ignore the dirt in the last pic on the white fiberglass. Hope this helps & would highly recommend the product. Thank you Cory for sharing your build! Cory took this beauty GMC van on a trip down to the desert where it served him well and gave him some great memories that he still cherishes today. Cory wanted to do a complete body job to his van but after weighing the costs and time to prep for a traditional body job, he contacted RAPTOR Liner Canada to get info on how much product he would need and how well we could match his GMC Dakota Brown original colour. Well I think Cory hit it out of the park. First picture is his original photo from down south with his ride... He then shared his restoration with RAPTOR... 3 kits, and he's almost done... just has to put doors and trim back on... More photos to follow... Let us know how you like it. Rebecca and her husband took this old 1990 Power Ram 250 Cummins Turbo Diesel that had lots of holes and was in need of some new metal welded in spots to make her solid again. As you can see they picked a great colour and the green that the picked along with RAPTOR Liners texture has turned this old girl back into a new beauty! Three 4 Litre Tintable kits was what it took to wake up the classic RAM appearance. Great thanks for sharing it with us! I figured I would share some photos of the coating I just put down on my garage floor. The floor itself wasn't in great condition, it had a lot of spalling concrete that I repaired myself, The previous owner never sealed the concrete and after a few years of winter ice it had some big ruts. But I rolled on about 15 liters of tint-able raptor bed-liner to cover the 900sqft. (around 19 liters total with tint) I would recommend doing a second coat if you want to hide more sins, or perfect coverage. But I was happy, and didn't feel like doing another coat. The nice thing about raptor, is how it handles. its one of the most rugged coatings when it comes to acidic chemicals. I have heard if a coating can handle aviation hydraulic fluid for 5 minutes, its good... this can handle it for 24 hours! it can handle acids, and brake fluids without a problem. Larry from Oakville Ontario shared his concrete floor experience with us... Nice floor! Step 2 Wash the floor with a concrete degreaser and let dry. I used the tintable product so I had to use a Urethane base coat to get my colour, this is 100 ml to each 1 litre bottle. I applied one coat, and let it setup and applied a second coat 40 to 60 minutes later. On the last coat I would work a 4' by 4' , once done I applied the speckle coat which is a bag of flakes to give more color. Wear a mask as the smell is quite strong and wear gloves. 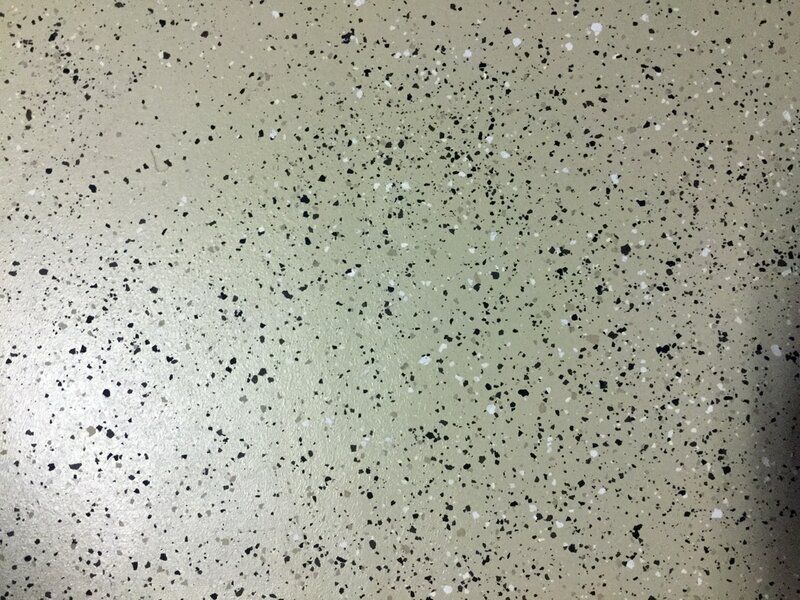 Sparkle flooring, this is the picture of the sparkle flakes, it is best to sprinkle these over a 4x4 area on the last coat of Raptor while it is still wet. I suggest you get a kit and play around with it. One of our customers has used RAPTOR several times to coat his and a couple buddies grilles with our black textured coating. Take a look at some of his work. He says its all about the prep. Make sure it has been scuffed up everywhere. Clean well, let dry and spray on at least 2 coats with gun pressure set for best texture result you like. Always a good idea to spray some cardboard or newspaper to see how its going to lay out before you attack your project. Equipment Services refurbish cranes and highlifts for resale. They spray them with tintable Raptor reduced down 10% and shot out of an HVLP gun. They needed a product that would hold up to the abuse that they are put through on a daily basis and have been working with the RAPTOR and are extremely pleased with the results. They average 5 to 6 cranes a week. In the picture are the finished cranes. This local aluminum boat building factory frequently coats it's aluminum boat floors with RAPTOR Liner and RAPTOR's Traction Additive for long lasting durability and non slip texture. Tony's 2009 F150 needed a shot of Raptor to freshen it up. The front and rear lower painted bumpers were showing signs of rust that really show up on his white bumpers as you can see in the photos. A local body shop sanded the rust and prepped the bumpers for colour code matched tintable Raptor. 1L of tintable Raptor was more than enough to do this minor fix. Tony was elated with the texture and durability of the new coating that looked factory fresh. John has taken RAPTOR and covered below the windshield pillars on his 1987 Pontiac Firebird for a new textured look on a classic. He reported that he loves the way it went on and the result. Just waiting for some RAPTOR Liner decals to add. This is what Shawn did to achieve exact Colour Match... this is not "Tintable Raptor Liner"
I used it on both box panels step 1 was cutting out rust welding in new outer panel patch. Step 2 was applying raptor liner (black) over wheel well lips and Lower bottom 3 inches up (was sanded with 120 grit for raptor liner) the raptor liner was applied at 80psi as customer wanted little as possible texture. Step 3 was curing the raptor on bake cycle for 1 hour. Step 4 I applied a sealer coat value shade 4 (as recommended for top coat coverage) of cromax urethane sealer le3440s flash for 20 mins. Step 5 I applied my waterborne paint colour (wa926l) let dry. Step 6 2 coats of cromax le5100s clear coat. Turned out awesome! Lighter colours do tend to show the bedliner texture more so maybe in future I would reduce it... I sure loves this productMakes my job easier when I can trust a product to withstand and meet customers needs! Awesome product. Very easy to apply. Good coverage. Looks good and tough as a box liner should be.